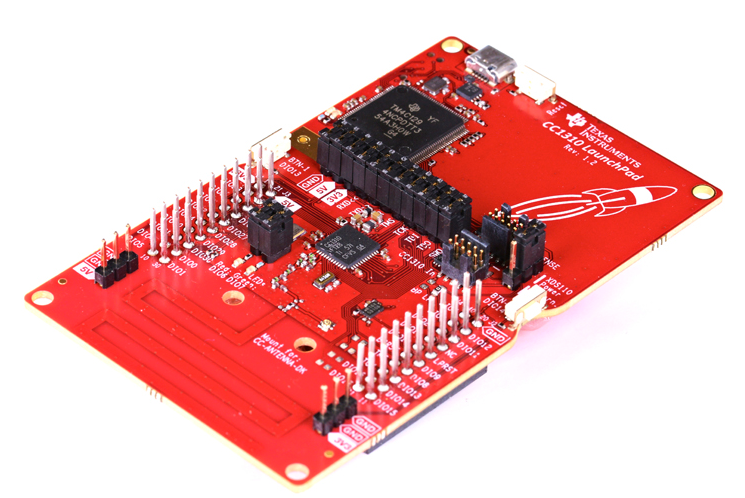 I try to use the CC1310F Launchpad by TI to communicate with the Sigfox infrastructure. On Windows, run the SmartRF program. You should see two connected devices (one CC1310 LaunchPad has two interfaces). Select the XDS110 Class Application/User UART. At first, the device is “Unknown”. You have to select the target device. I have a CC1310F128. You can now get board information such as the MAC address (we will need it soon). The only way I found was to send an email to tech-pi-team@sigfox.com and ask for it. They replied with 3 hours. Send an email to sigfox@list.ti.com with the MAC address, your name and the company you work for. They should reply with one sigfox_data.h per device. I first had the following error with TI-RTOS version 2.21: Description Resource Path Location Type: identifier UARTCC26XX_HWAttrsV1 is undefined CC1310DK_7XD.c /TI_SIGFOX_CC13xx_v0.13 line 133 C/C++ Problem I then installed a previous version (2.18) following this post. It did not work. I restarted CSS. It worked. I then found that I had to change UARTCC26XX_HWAttrsV1 to UARTCC26XX_HWAttrsV2 for it to work with the TI-RTOS version 2.21. Connect to the terminal (I use minicom) with the following parameters: 115200 8N1 I got a nice: Initialization error This is because I have to replace the file sigfox_data.h by the one that TI gave me. Once the board is flashed, you can connect throught the terminal (minicom). No message should be displayed. To see what you are typing, enable “local echo”. Write the following and press enter: `AT$ID?`` A wild 8 digits device ID appears ! Write the following and press enter: `AT$PAC?`` You should get a 16 digits PAC number. Activate you device using your device ID and PAC number on: https://backend.sigfox.com/ If it does not work, send an email to Sigfox again. I got a reply within a day. My device was activated after 3 days. I am sending the data in Json to a node-red instance on IBM Bluemix.